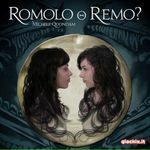 The Romolo o Remo contest is here! Unfortunately is not possible to publish picture of children. So do not post them. Ahahah, "The Force is with you, young Skywalker, but you are not a Jedi yet."